With a stunning selection of brand new arrangements, the Swingles’ return to disc promises some of their best and most memorable performances to date on this studio album. The warm, beautiful tone and precision of the groups voices are combined with a modern edge; with vocal percussion and beatboxing featuring guest performances from Shlomo, the world renowned beatboxer, and the Vocal Orchestra. What is it about the Swingle Singers in 2007 that makes us so different from previous incarnations of the group? What are we doing now that’s new and innovative? These are questions posed often by many people who encounter the group, asking what has changed in the past 44 years. We looked for the answer and found that, slowly and naturally, a new element had been filtering into our live shows that made a sonic impact and has rendered itself indispensable: vocal percussion. This album is the first Swingle Singers disc where every track contains vocal percussion or human beatboxing, not just as a component in the sound but more as a real feature to the arrangement. 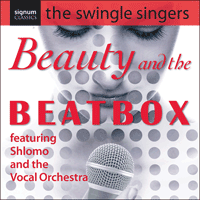 With these arrangements, we wanted to showcase the vocal talents of the group in ways that have not necessarily been shown on Swingle Singers’ records before—aside from the crunchy beatboxing of Jes and Tobias, all of the singers have contributed to the vocal percussion, particularly in creating the samba band feel of the latin arrangements. In the same way that the group of the 1960s fused the music of Bach with vocalese jazz to create something new from two different musical eras, without changing a note; the arrangements of Dido’s lament and Albinoni’s Adagio show that the group is continuing this tradition, this time mixing Baroque works with contemporary beats. Recording in the studio has given us the opportunity to expand some of the live versions of the arrangements into their full sized equivalents. The latest arrangement from Ward Swingle, It’s sand, man!, has been rearranged into a big band score, with the full forces of sax, trumpet, trombone, guitar and rhythm section parts, in an homage to one of the group’s most influential albums, Skyliner (1979). Ravel’s Boléro, a huge hit with our concert audiences worldwide, with its added parts here has more of an orchestral richness, and the same technique achieves the sound of a full organ in Albinoni’s Adagio. Making a special appearance on this album is Shlomo, a great friend of ours, a talented musician and awe-inspiring beatboxer. After inviting him to join us for a London Jazz Festival appearance at the Vortex Jazz Club in 2006, we knew that we had to collaborate with him again. Developing the idea of the Swingle Singers being a human loop-station, Shlomo called on us to create the UK’s first beatbox choir: a mixed force of singers and beatboxers, all influencing and learning from each other, and blurring the boundary between singing and beatboxing. The Vocal Orchestra was born at the Ether Festival in London’s South Bank Centre in March 2007, and is now a fully formed festival act. We’re very proud to be a part of this amazing project, and hope that you enjoy listening to a little taster of what we got up to. In recording this album we have realised that our rhythm section has become the essential foundation and structure for the vocal parts it supports: one doesn’t make sense without the other. When stripped down to its bare essentials, what we are hoping to achieve with this new sound is a perfect balance of lush vocals and street beats, which we hope you will find in Beauty and the Beatbox!